Another Beautiful Day in Paradise. We had clear blue skies, temperatures in the high 80s and a NW breeze. 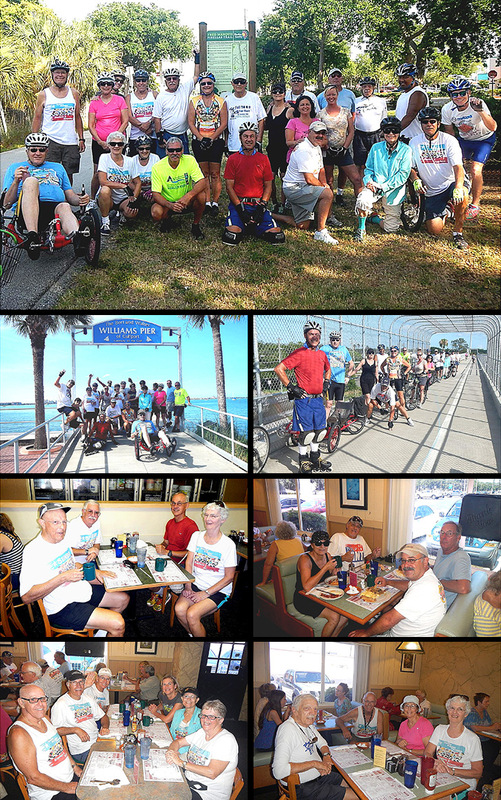 Bicyclers/Bladers Bruce M, Nancy L, Pam R (1st time), Jim F, Dee T, Janice H, Steve G, Ginnie S & Rick P, Amie H, Laura P, Roy H, Bob L, Breeze, Kevin K, NIck S, Carol J, Wilma F, Andrew F, Jeff B, Rob H, Linda & Dan C came. Welcome all. Today we did a detour to Gulfport to check out the trail to Gulfport and the Gulfport restaurants. We found two restaurants open and a trail that was acceptable. Twenty one Bicyclers and two Bladers came. Round trip to Gulfport and back was 13.5 miles.